Tom has over 25 years experience representing clients in a multitude of complex business and financial restructuring matters throughout Oregon and Washington. He also represents Pacific Northwest clients in bankruptcy cases in other courts throughout the United States. He has served as lead counsel to business debtors, secured and unsecured creditors, committees, and trustees in some of the larger Chapter 11 cases in Oregon and southern Washington. He also regularly represents Chapter 7 bankruptcy trustees and receivers. Tom has litigated interest rate issues, asset valuation, Section 363 sale issues, use of cash collateral and adequate protection, relief from stay, preferences, fraudulent transfers, discharge, and contested Chapter 11 confirmation issues. He has argued appeals to the Ninth Circuit Bankruptcy Appellate Panel and the Ninth Circuit Court of Appeals. Tom was Debtor's counsel in two of the most highly-publicized and complex Chapter 11 cases filed in the Pacific Northwest in the last decade in which he represented the Archdiocese of Portland and the Society of Jesus, Oregon Province. Those were the first Chapter 11 bankruptcy reorganization cases filed by a Catholic diocese and a Catholic religious order in the United States. Tom and the bankruptcy team at Sussman Shank litigated issues in those cases regarding canon and civil law, charitable trusts, property of the estate/ownership issues, future claims estimation, and a myriad of other issues in confirming plans of reorganization. He also provides counsel to other non-profit and religious organizations concerning the intricacies of both their religious and civil law structure and finances. 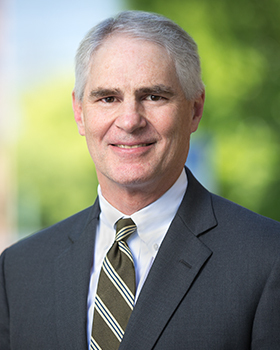 Tom is an active member of the Oregon State Bar Debtor-Creditor Section, having served on its Executive, Annual Meeting, and Legislative Committees. He was Chairperson of the Section in 2006, Chair of the Legislative Committee from 1996-2001, and Chair of the Annual Meeting Committee from 2012-2015. For over 20 years he has instructed other lawyers on debtor-creditor and bankruptcy issues for the Oregon and Washington State Bar's CLE programs, has written numerous CLE articles, and is currently the co-editor of Sussman Shank's Pacific Northwest Bankruptcy Blog, which provides information and comments on debtor-creditor issues and bankruptcy cases to lawyers and other restructuring and bankruptcy professionals. He is also an active practitioner in southwest Washington bankruptcy cases, regularly appearing for clients in the Western District of Washington bankruptcy courts in Vancouver and Tacoma. Tom has been recognized as one of the top attorneys in Oregon by both Best Lawyers® in America and Super Lawyers®. He has annually been included in the Super Lawyers® list in Bankruptcy and Debtor/Creditor Rights since 2007, and on the Top 50 List of all Oregon lawyers from any practice area since 2012. He is listed as one of the Best Lawyers® in America for his skills in Bankruptcy and Creditor Debtor Rights/Insolvency and Reorganization Law and for Litigation - Bankruptcy. Tom is rated AV® Preeminent Lawyer in Martindale-Hubbell, the highest possible peer review rating in legal ability and ethical standards. Tom is originally from Texas, having graduated from the University of Texas at Austin McCombs School of Business and the University of Houston Law School before moving to Oregon in 1988 to pursue his legal career. He has been a member of the Sussman Shank legal team since setting foot in Oregon and a partner in the firm since 1997. Tom is licensed to practice in all courts in Oregon and Washington. Representation of various non-profit and religious entities facing financial difficulties, including consultation regarding alleged claims of sexual abuse and providing counsel on various options available for resolving such claims including litigation, mediation, arbitration, settlement, and bankruptcy reorganization. Representation of numerous real estate developers and builders engaged in the Oregon and Southern Washington residential real estate market, including out-of-court workouts with lenders and, if necessary, Chapter 11 bankruptcy filings. Represented a builder/developer in one of the first Chapter 11 real estate reorganization cases filed in Oregon in 2008 as a result of the residential mortgage crisis and the dramatic downturn in the national and regional real estate markets. Representation of a major financial institution specializing in construction financing for hotels, condominiums, and multi-family real estate projects resulting in the successful reorganization of one of its borrower's hotel projects and payment of the client's claim in full. Representation of a California casino operator (creditor) in a Chapter 11 proceeding resulting in confirmation of the client/creditor's plan and rejection of the debtor's plan that lead to full recovery of the client's claim against the debtor. Representation of one of the nation's largest heavy-equipment financing companies in both bankruptcy and non-bankruptcy cases, including proceedings to obtain both pre-judgment and post-judgment recovery of the client's collateral. Regular representation of bankruptcy trustees in both business and individual debtor cases filed in Oregon and Washington. Representation of creditors (including landlords) in bankruptcy cases filed by large multi-state retailers and other businesses in other jurisdictions such as Delaware, New York, and California. Representation of Chapter 11 agribusiness debtors engaged in the growing, marketing, and transportation of various farm products. Representation of a non-profit citizens' ad hoc committee in a Chapter 11 case involving the local community hospital that lead to the successful reorganization and continuation of healthcare services within the community and surrounding area. Representation of a major motor home and travel trailer manufacturer in Chapter 11 resulting in a successful reorganization that preserved both the manufacturing business and numerous jobs in the local community. Representation of a well-known Central Oregon destination resort in Chapter 11 leading to the successful reorganization and continued operation of the resort. Representation of lenders in various Chapter 11 proceedings involving litigating over the value of collateral, appropriate interest rates, and other confirmation issues.